You certainly don't need the Facebook Portal, whose primary purpose is to let you make the types of video calls you can already make on Facebook's Messenger app. And given the company's poor record on user privacy, do you even want it? Or a similar device from Amazon or Google? If you are a tech trailblazer willing to try new things—and have no qualms on privacy—here are some things to consider. Facebook's $349 Portal Plus is a great device for making video calls using Messenger. It's also gigantic—15.6 inches, measured diagonally, or roughly the size of the window of many microwave ovens. There's also a smaller sibling, simply called the Portal, at $199. Both models are designed to do one thing and one thing well—let you chat with other people on their own Portal or through the regular Messenger app. Yes, the Portal can do a few things more, such as tap Amazon's Alexa voice assistant, but these features feel tacked on, much like trying to cook breakfast sausages with a toaster created just to cook hot dogs. Unless you are in a long-distance relationship and want to spend hours each evening gazing into your sweetheart's eye (while also getting dinner and laundry done), you can certainly live without one, just as you can live without a hot dog cooker. That's especially true if you are concerned about the number of screens in your home, especially screens that could be watching you. 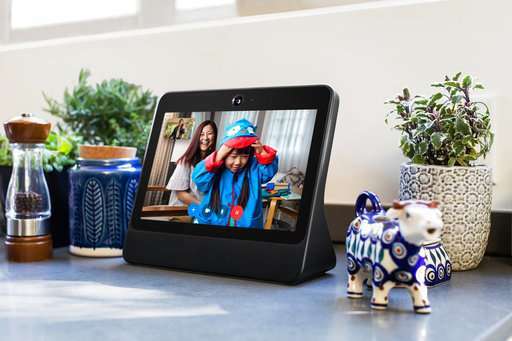 Google's Home Hub ($129) and Amazon's Echo Show ($230) can do a lot more, but their video-calling capabilities aren't as good as the Portal's. With Home Hub, for instance, you can see the person calling you, but the device itself has no camera for two-way videos. Portal also has a cute "story time" feature that adds face masks and other animation while you to kids on the other side of the call. The Google and Amazon devices don't do either. All three devices allow you to add multiple users, so different people in your household can call their circle of friends. But you're locked into that company's messaging system. Try explaining to your 87-year-old grandfather why he can't FaceTime you on the Portal or Skype on the Home Hub. Hell will freeze over before you can get him to sign up for Facebook just to chat with his great-grandchildren. And you haven't even mentioned the Cambridge Analytica privacy scandal yet. The good news is you can make calls from these devices to smartphones, though in the Portal's case, you need the device to tell the animated stories. Traveling parents likely won't be lugging one to read to their kids at home. As for compatibility, Facebook's Messenger has more than 1 billion users, and many of your friends are likely already on it, at least in the United States. But Portal doesn't work with Facebook's WhatsApp, which is popular overseas. Setting up the device is relatively simple. The Home Hub works with Google's Duo messaging service, so friends and relatives will have to at least install the Duo app on their phones. It's also difficult to set up. After much cursing and online searches for the right settings, I still get error messages. Google press representatives didn't immediately respond to help requests. Clearly a lot of thought went into making the Portal optimal for connecting with friends and family. It's just a shame that it comes in a year full of privacy scandals for the company. True, Google has had its share of privacy issues this year, including an Associated Press report that it tracks people's location even when they tell it not to . But with Facebook, it's something new every few weeks, culminating with revelations this week from The New York Times that Facebook shared user data with more than 150 other companies without people's explicit permission. While it's possible to use Messenger on the phone without having a Facebook account, Portal still requires one. Facebook says it's to enable other features, such as displaying Facebook photos on your Portal. But these features aren't essential to video calling—just essential to fold the Portal experience into Facebook's massive advertising system. Facebook says it doesn't listen to, view, record or store the content of your calls, so if you believe Facebook—and that's a big if—it's not going to try to target ads based on whom you talk to or what's hanging on your walls in the background. But other information, such as the length and frequency of your calls, is fair game and may be used for advertising purposes—such as ads for video-calling services. No doubt to address privacy concerns, Facebook has included a plastic cover for the Portal's camera. You can also turn it off using a button. But promises and plastic covers aren't enough when Facebook has shown carelessness with its users' data over and over.